Turning your favorite lolcat into a shirt could win you $2,500 in WeLoveFine and Cheezburger's design contest. If you have cats, you might think yours are the greatest felines of all time (and rightfully so). Even if you're not a cat person, you've undoubtedly stumbled upon some humorous photos of internet-famous kitties while perusing your favorite websites and social networks. Cats are everywhere (and possibly planning your demise), and now you can finally profit from them. The online pop culture apparel shop WeLoveFine is teaming up with Cheezburger.com for the I Can Has Cats Design Contest, with a grand prize up to $2,500 and a chance to see your shirt design added to WeLoveFine's inventory. 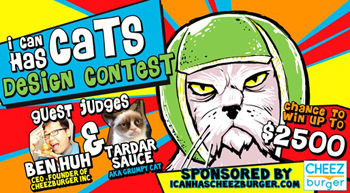 Of course, to win you'll have to impress the judges, Cheezburger CEO Ben Huh and Tardar Sauce (better known as Grumpy Cat). The contest is open now and runs until 11:59 PM PST on December 11, with 86 designs submitted as of this writing. "Whether they are part of Cheezburger.com's extensive (and hilarious) LOLCats archive, or a regular staple on your Tumblr feed, or an actual silly, awesome cat that belongs to YOU," pretty much any cat image can be used in your shirt entry. If you're looking for inspiration (or just want to see more cats), you can check out the current entries, which currently include ninja cats, Portal cats, and appearances by many prolific cat memes. Once you're ready, you can submit your design through the contest page, which also has additional prize information. Judging begins on December 12 and will run until January 20, with winners being announced on January 23, 2013. Good luck, cat people!